Not from me, I'm trying like hell to win one myself. These phenomenal creations are from the proprietor of Crookedart, Lana Crooks. 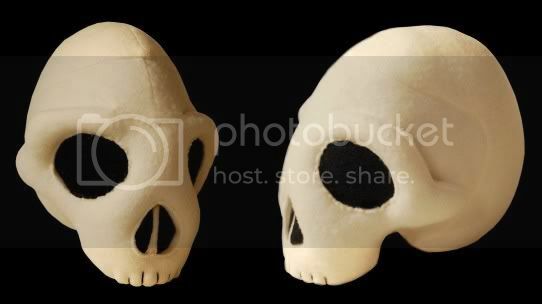 Lana is looking for a name for her plush skull series and needs your help! You can enter the contest and learn more about her work at ToyCyte.com. Lana is picking a winner from all comments received by Sunday, January 18th at 12noon PST, so hurry up and get your vote in if you want one of these special skulls.